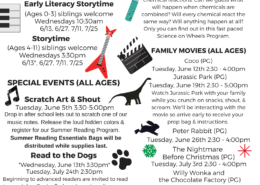 Summer Reading Programs Rock the Library! The Cherokee County Public Library will host its annual Summer Reading program throughout June and July. 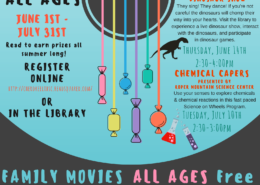 The Summer Reading program will consist of events held at both the Gaffney and Blacksburg locations of the library as well as through reading challenges over the course of the summer. Patrons of all ages are encouraged to participate, with activities and challenges designed for all ages. Patrons participating in the reading challenges can register online through the library’s summer reading portal at http://cherokeelibsc.readsquared.com/. The portal will open on Friday, June 1. Adults are encouraged to visit the library to pick up a Bingo card for a chance to win instant prizes and to be entered into a raffle. Patrons can stop in to the library to find the requirements for each age-based reading program, with prizes awarded as each milestone is reached. 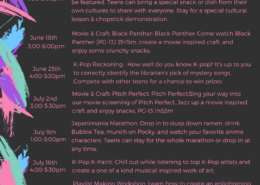 A variety of programs will also be offered throughout June and July at the libraries. 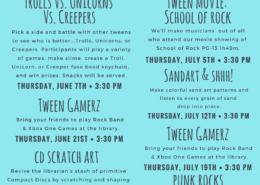 Events for the summer will follow this year’s theme of “Libraries Rock!” Traditional storytimes will take place at the Gaffney Library every other Wednesday beginning June 13th. Storytimes will take place at 10:30 (for ages 0-3) and 3:30 (for ages 4-11), though siblings are welcome to attend either program. Music and Movement Storytimes will be offered at the Gaffney Library on alternating Wednesdays beginning June 6th at 10:30 and 3:30, and will feature more musical stories as well as the opportunity to create a different musical instrument craft at each program. This year, the library is also offering a new opportunity for local talent. Cherokee County artists, musicians, and performers can apply to present their talent at the library. A sample of the work or performance is required and applications are available the circulation desks in Gaffney and Blacksburg. The library has already begun scheduling art showings and short concerts of local residents.